It’s sometimes hard to imagine just how big and wide reaching a hurricane can be. 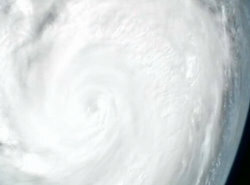 The video below captures Hurricane Irene as she blows across the Bahamas at 3:47 p.m. on August 25, 2011. After Hurricane Irene was done with the Bahamas, she made her way up the east coast and made landfall as a tropical storm in New York City.